You would think nothing had changed since 9/11. Critical academic works on the Saudi kleptocracy are rare. Many Arab Studies departments on Anglo-American campuses receive generous endowments from the Saudis and other Gulf states. The interaction between Saudi society and Aramco had its beginnings when the Saudi government granted its first concessions to Standard Oil of California in 1933. Local tribal leaders and the royals collaborated eagerly during the early years, becoming more critical only after the nationalisation of the Suez Canal in 1956 created a radical anti-imperialist fervour that swept the Middle East. Crown Prince Faisal became king and his nephew Prince Faisal ibn Musa assassinated him in 1975. Faisal is largely responsible for the Saudi Arabia that exists today, with its reliance on Wahhabism for social control. Faisal believed that the only way to defeat Nasser and the godless Communists was by making religion the central pillar of the Saudi social order and using it ruthlessly against the enemy. Even after Saudi oil was fully nationalised in 1980, Washington's politico-military elite maintained their pledge to defend the existing Saudi regime and its state whatever the cost. The Sauds kept the size of the national army and air force to the barest minimum. The armaments purchased to please the West rust peacefully in desert warehouses. For a decade and a half, the Pakistan Army sent in contingents to protect the family in case of internal upheavals. Then, after the first Gulf War, the U.S. military arrived. American bases in Saudi Arabia and Qatar were used to launch the war against Iraq. All pretence of independence had gone. Foreign armies have historically provided one sort of protection; Wahhabi theology another. Ibn Abd al-Wahhab, a Koranic literalist born in the 18th century, preached a primitive but effective message to the peninsular Arabs. He found a willing listener in the founder of the Saud dynasty and a concordat was signed and sealed. The Saud clan would embrace the Wahhabi interpretation of the Book, and al-Wahhab would work exclusively with the Saud tribe. The defeat of 1818 taught the Wahhabis the art of survival. 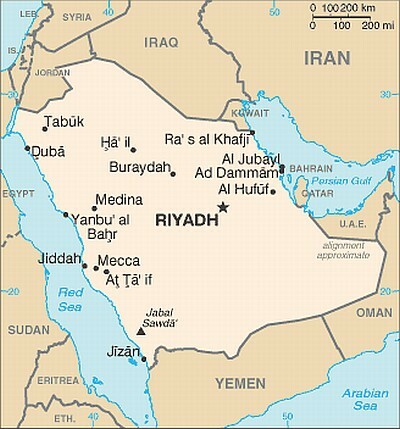 The Sauds fought with the British against the Ottoman Empire and later accepted U.S. suzerainty. As Wahhabism was the only permissible discourse, differences of interpretation and state policy were bound to erupt. One outcome was al-Qaida. Tariq Ali is a novelist, historian, political campaigner and one of New Left Review's editors. Born in 1943 and raised in Lahore, British India, now Pakistan, he read Philosophy, Politics, and Economics (PPE) at Exeter College, Oxford, and was elected President of the Oxford Union. He lives in London. AR (2007) As a garrulously disputatious Trotskyite, Tariq Ali was one of the more notorious alumni of my college. His views are often interesting but generally too leftist for me. King Abdullah bin Abdul-Aziz Al Saud, Custodian of the Two Holy Mosques, is 86. He was troubled to see the avalanche unleashed by the young protesters in Tunis. He was disgusted to see what happened to Mubarak in Cairo. But when the spark of revolution jumped to Bahrain, the king sent in his national guard soldiers to crush the uprising. Saudi Arabia cannot intervene directly in Syria. The House of Saud and the clan of Syrian President Bashar Assad have eyed each other suspiciously for years, but the two leaders both want calm in their countries, not change. Yemen has been confronted with chaos since the eruption of the Arab Spring. Last week, the Saudis announced that they were sending a donation of 3 million barrels of oil to the Yemeni leadership. Saudi Arabia is expected to earn $300 billion in oil revenues this year and is currently responsible for 12 percent of global oil production. Jamal Khashoggi is one of the most outspoken intellectuals and progressive thinkers in Saudi Arabia. He was a good friend of Osama bin Laden in the 1980s and last met him in Sudan in 1995. Khashoggi is building a television network modeled after Al-Jazeera. Sitting in his office in the Kingdom Tower, 300 meters above the city, he says: "The absolute monarchy is obsolete. Democracy is the only solution." Khashoggi confesses that he had long shared bin Laden's view that there are only two ways to liberate the Arab world of its corrupt regimes: by infiltrating the political system through its institutions, or by violently overthrowing the corrupt ruling cliques. A drive through the kingdom today reveals a society that senses that things cannot continue the way they have been going. A decree recently issued by the king, under which the grand mufti and other clerics can no longer be criticized, probably says more about the dwindling power of the religious leaders than about their strength. Opposition figures are constantly being imprisoned. Some 11,000 have been arrested since 2001 and more than 5,000 are still in prison today. General Mansour Sultan al-Turki of the Saudi Arabian Interior Ministry sits in a leather armchair in a wing of the Interior Ministry in Riyadh and says, "We must be careful that the current doesn't wash us away." He is part of a generation that perceived the introduction of the telephone as "confusing and dangerous" because it would enable women to speak to strange men. The general has daughters. "The woman is a cause for concern," he says. Globalization is changing Saudi society as much today as the religious reformer Mohammed Bin Abd al-Wahhab, who preached the pure teachings of the Prophet Muhammad and the strict separation of the sexes, did 200 years ago. As they have everywhere else in the Arab world, the Internet and television have invaded Saudi Arabia. The divorce rate is 40 percent, families are shrinking, cities are exploding, and a third of all Saudi Arabians are overweight. Some 2 million of the country's 20 million citizens are studying in universities. After studying abroad, they want the same things that their parents have: a driver, a nanny and a gardener. But there are no jobs, and 26 percent of men are unemployed. Young women make up 52 percent of university students. Many men are horrified at the thought of these women driving themselves to work in the future. Interior Minister Nayef bin Abdul-Aziz is seen as a counterweight to, and potential successor of, his brother, the moderate reformist Abdullah. Nayef's ministry is a bastion against all those who could destabilize the Saud monarchy, which has ruled the country for two generations. A law has been in place for the last three months that bans demonstrations. Shiites seem not to be fundamentally opposed to the state or in favor of overthrowing the king. Instead, they are protesting over civil rights, for recognition and against discrimination. The Shiites make up about 10 percent of the population, but they are not permitted to serve in the military or hold high office. They are denounced in the schoolbooks as heretics. Until now, the government has simply had to reach into its coffers to keep the people happy whenever there has been a problem. King Abdullah recently promised his people $129 billion in new benefits. He approved low-interest mortgages, forgave the debts of the families of deceased farmers, and ruled that students no longer had to repay the government for their foreign tuition. He also raised the salaries of civil servants by 15 percent and introduced unemployment insurance. Medical care is already free for Saudi citizens. Under these circumstances, who would rebel against the government? Jamal Khashoggi: "We can't just spend another 100 trillion riyal tomorrow to keep everyone happy. What do we do when the oil runs out? This nation will be reformed, just like other nations. We too need freedom, transparency, the rule of law, a prime minister, a real parliament." It's no surprise that Khashoggi has been fired several times from leading Saudi newspapers. The female blogger Kholoud al-Fahad, 30, lives in Damman and is the mother of two children. She wears her hair uncovered. In addition to refusing to wear the face veil known as the niqab, Fahad often goes out in public without a headscarf. She writes angry articles about the fact that women in Saudi Arabia are not permitted to travel without the signed permission of their so-called male protectors, that they were not allowed to vote once again in local elections in September, even though the law only requires that a person be 21 years old, be in full command of his mental faculties, and have a Saudi passport. Fahad could easily lead a comfortable life behind the walls of her large house. But she wants to become a TV host. Her family is horrified over the prospect of her showing her face to an audience of millions. In 2009, the king opened the King Abdullah University of Science and Technology near Jeddah. He had ordered the separation of the sexes to be lifted at the new institution, where women and men sit next to each other in lecture halls. The king and his princes are the glue that holds society together. Soon the king could be a man who was educated at an elite American university. The only question is whether the kingdom will first experience a period of gerontocracy. The sons of the country's founder, Ibn Saud, are all older than 65 today. Perhaps the biggest source of instability lies in family rivalry over the throne. Jamal Khashoggi: "History is happening. No one can stop it." Saudi Arabia is the spiritual center of the Islamic world, the world's leading oil exporter, and the leader of the Arab world. But King Abdullah is 88, Crown Prince Sultan is 87, and Prince Nayef, the third in line for the throne, is 78. The Arab Spring has put them on the wrong side of history. Last week's gathering of OPEC oil ministers in Vienna ended in discord, with Saudi representative Ali al-Naimi describing it as "one of the worst meetings we have ever had." Naimi wanted to increase production quotas in order to ease high oil prices. But Iran led a bloc of OPEC members that preferred high revenues. The Saudi response is predicted to be a unilateral increase in production. Prince Bandar bin Sultan was recently trying to recruit Muslim mercenaries from Pakistan, Malaysia, and Indonesia to defend the kingdom and the more vulnerable members of the Gulf Cooperation Council (GCC). The GCC is a motley collection of sheikhdoms that also includes Kuwait, Bahrain, Qatar, the United Arab Emirates, and Oman. The endangered kingdoms of Jordan and Morocco were reported to want to join the club. Iran looms menacingly. Saudi Arabia's leadership sees Tehran as a force for mischief and subversion in the region. Iran's leadership of the Shiite world is as central to its identity as Saudi Arabia's role in the more populous Sunni community. In a game timed in terms of centuries, Riyadh is worried that Tehran has control of the ball. As for the Israel-Palestine mess, Prince Turki al-Faisal recently wrote: "U.S. domestic politics and Israeli intransigence cannot be allowed to stand in the way of Palestinians' right to a future with a decent quality of life and opportunities similar to those living in unoccupied countries." Saudi Arabia, he declared, would use its "considerable diplomatic might" to support the Palestinians' bid for international recognition at the United Nations in September. Turki reminded the world of the 2002 Arab Peace Initiative, which offered peace to Israel in return for total withdrawal from occupied Palestinian and Syrian territories, including East Jerusalem, and a mutually agreed solution of the refugee issue. This is often seen as a ploy to distract world attention from Saudi involvement in the 9/11 terrorist attacks. In Saudi Arabia, the only written charter asserts the Koran as its basic law. The religious leadership adheres to the puritanical branch of Islam known as Wahhabism. With three quarters of the Saudi population of 28 million under the age of thirty, Saudi Arabia faces many of the same social problems as Egypt and Yemen. Nearly 40% of Saudis aged 20 to 24 are unemployed, and drawn to radicalism. The country suffers from a housing crisis and chronic inflation, there is recurring domestic terrorism, and the outskirts of Riyadh and Jeddah are plagued by poverty, drugs, and street violence. The Al Saud dynasty often seems geriatric and disconnected. Only Egypt ranks ahead in Facebook usage in the region, and a high proportion of Saudis now use Twitter and YouTube. This has made it easier to expose alleged corruption by members of the royal family. There are thousands of princes in the royal family, each getting a share of the mostly hidden national budget. Karen Elliott House sees a country whose people are seething with discontent and whose leadership reminds her of the dying decade of the Soviet Union. She finds appalling evidence that some women are subjected to virtual slavery, in which wives and daughters can be abused at the whim of male family members protected by an all-male criminal system and judiciary. Thomas W. Lippman finds scant evidence that any substantial portion of the Saudi population wants to replace the regime. He believes the outside world can assume that the House of Saud will stand, provided that oil revenue continues to flow. He laments the Saudi education system, which has produced a lost generation of young Saudis. The Saudi government has made hardly any progress in weaning itself from oil. Saudi Arabia built a technologically advanced welfare state. This radical transformation was masterminded by the royal family to strengthen its rule and neutralize any pressure for political reform. U.S.�Saudi relationship are oil security, stability, and counterterrorism. The viability of the Saudi regime depends on whether defensive change can continue to persuade a majority of Saudis to tolerate a repressive government. Saudi Arabia will remain a strong Western ally. Prince Muqrin bin Abdulaziz, 67, has been appointed second deputy prime minister and will likely assume power in the coming years. Perhaps more important, King Abdullah has elevated competent younger princes to prominent roles within the kingdom. There is no constituency within the House of Saud for undermining the pillars of its foreign policy. Saudi Arabia will remain a regional ally for the United States and its allies. U.S. and British defense guarantees underpin the kingdom's deterrence posture. The kingdom pumps 9.25 million barrels of oil a day and claims to be able to add an extra 1 million barrels to the global market at short notice. Saudi Arabia may not be the most palatable ally for some in the West, but reform is coming. The appointment of 30 women into the Majlis al-Shura, a 150-member consultative council with the power to draft laws, was a huge step forward. King Abdullah removed many conservative advisors and sheikhs who raised objections to his social reforms. Western countries and Saudi Arabia have a common enemy in al Qaeda, and cooperate closely on intelligence and counterterrorism matters. The importance of Saudi Arabia to counterterrorism efforts is evidenced by the access of Saudi Interior Minister Mohammed bin Nayef to the highest circles on his visits to Western capitals. The Saudis have too much clout in the Mideast to dismiss them as counter to Western interests. In Bahrain, no political agreement can be made without approval from Saudi Arabia. In Yemen, the president cannot gain control over his territory without Saudi assistance and financing. Saudi money will also play a role in determining the balance of power in Syria, Iraq, and Egypt. Saudi Arabia views all three countries as targets for Iranian expansion, which it resists. Saudi influence and patronage in those areas must be understood and respected. Those who believe in a coming Saudi apocalypse usually assume Saudis would seek the wholesale downfall of their monarchy, if only they were not so oppressed. But the kingdom is far more politically accountable than Arab countries that underwent revolutions in 2011. Traditional governance structures in many parts of the kingdom still prevail, and the role of the provincial governor in attending the daily majlis to address the problems and needs of his constituents is still important in maintaining ties between the people and the ruling elite. Saudis are not about to erupt in mass revolt. For nearly 15 years, the House of Saud has been battling a threat to its legitimacy from Islamic extremists. The insurrection of al Qaeda dissidents represented an existential threat for the kingdom because it struck at the heart of the foundation for the regime's legitimacy. By overcoming it, the House of Saud has proved its resiliency. Saudi Arabia will play an integral role in reshaping the Mideast. The oil will keep pumping and the arms sales will keep flowing. The House of Saud will hand the reins of power to the next generation without civil war. Some say Saudi Arabia would respond to Iranian nuclear weapons by developing its own bomb or buying nuclear weapons from Pakistan or sheltering under a Pakistani nuclear umbrella. The Saudis would wish to counter an Iranian bomb. But they are in no mad rush. They are likely to respond by bolstering conventional defenses and improving civilian nuclear capabilities. The Kingdom is unlikely to buy operational nukes from Pakistan. Pakistan has focused its strategic attention on India. A U.S. nuclear guarantee would likely outbid a Pakistani one. The best way to prevent a future Saudi bomb is to extend the U.S. umbrella. 1 Emphasize prevention, while planning for the worst. 2 Make Saudi proliferation more difficult. 3 Maintain leverage over Pakistan.